(Nanowerk News) An international research team has studied a new cell visualisation and drug delivery system based on nanoparticles coated with luminescent dye molecules. Scientists have found out that the particle material and the distance between the dye and the particle’s surface affect the intensity of the luminescent signal. It turned out that silicon nanoparticles coated with dye molecules are more efficient than similar particles made of gold. Thanks to their biocompatibility, silicon particles can be used for cell visualisation and drug delivery. The research was published in Scientific Reports ("Photoluminescence quenching of dye molecules near a resonant silicon nanoparticle"). Luminescent dyes are widely used in biological and medical research due to their high sensitivity and low toxicity. Nanoparticles used for drug delivery are often coated with such dyes. This enables scientists to track their path in the intracellular space. The intensity of the luminescent signal depends on the particle material and the distance between the dye and the particle’s surface. Scientists from ITMO’s Faculty of Physics and Engineering together with colleagues from Germany and Sweden have studied several configurations of various nanoparticles coated with luminescent dye molecules and identified the most efficient ones. 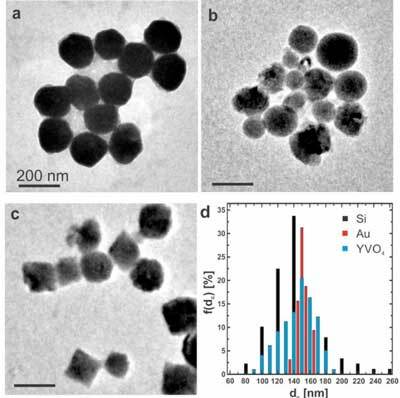 Scientists synthesized and studied three types of nanoparticles. Non-resonant yttrium vanadate particles (YVO4) were used as a control sample. Such particles do not affect the intensity of dye molecules. Gold and silicon particles of the same size coated with dye molecules placed at different distances from the surface were compared with the control sample. Modelling and experiments have shown that attachment of dye to silicon particles may enhance the photoluminescence of the dye up to three times compared to gold particles. “Such enhancement is due to Mie resonances in silicon particles. It is important to note that the resonant wavelengths depend on particles’ size. Because of the high refractive index, the Mie resonance of spherical silicon particles of about a hundred nanometers in size extends into the visible part of the spectrum. Thus, resonant silicon particles allow us to accelerate spontaneous emission and amplify the dye signal on the surface,” says Sergei Makarov, head of ITMO’s Laboratory of Hybrid Nanophotonics and Optoelectronics. The luminescence signal decays on the gold particle’s surface. That’s why the dye should be placed at a distance from such particles. To do so, scientists have to use chemical methods, which can be complex and costly. These additional steps can be avoided by using silicon particles which amplify the luminescent signal directly on the surface. Besides, the research has shown that silicon particles coated with luminescent molecules can be absorbed by cancer cells. “We think that silicon is a very promising material, especially for biomedicine. Study of drug delivery and bioimaging methods is a very fast-developing field at ITMO University. For example, we’re currently working on a delivery system based on hollow silica particles. Thanks to the team of scientists from the Faculty of Physics and Engineering, our University is gradually gaining recognition in the field of optics and drug delivery systems,” says Mikhail Zyuzin, a research associate at the Faculty of Physics and Engineering. In the future, these systems can be used not only to visualize intracellular structures but also to deliver various substances, from drugs to genetic agents, to cells.